For Americans, the Canal Zone (C.Z.) was a worker’s paradise. The government-created, utilitarian townships met workers’ basic needs and provided numerous activities for their leisure. To promote greater social cohesion, individual happiness, and high moral standards, Zone administrators encouraged employees to bring their families. As extra incentives, families received free housing and utility services. Public services, too, were essential. Fire departments, utilities, and railroads had to be kept up-to-date and run efficiently. Government-subsidized commissaries provided food and dry goods at cost. Any other shopping had to be done outside the Canal Zone, in places like Panama City or Colon, where prices were much higher. Medical care was also available to Canal employees and their families at various hospitals, including Ancon Hospital, which was later renamed Gorgas Hospital. The Canal Zone offered a variety of clubs, fraternal orders, hobbyist, and other specialized associations. The most popular of these being the Yong Men's Christian Association. 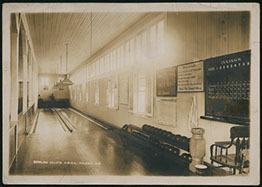 Zone administrators invited the YMCA to the Canal to provide recreation for men and maintain high moral standards; though some thought the Y was too liberal for letting women in and allowing bowling on Sundays. 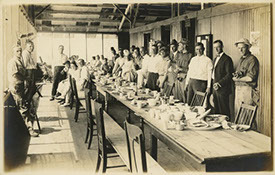 Group of men and women after a meal. Gelatin silver print. 2001.074.001.048 Panama Canal Museum Collection, George A. Smathers Libraries. Gift of Doris and Ken Tuley. Canal Employees and Families on fishing excursion at Gatun Spillway. Gelatin silver print. 2001.074.001.043 Panama Canal Museum Collection, George A. Smathers Libraries. Gift of Doris and Ken Tuley. Canal Zone Swim Team. 1921. Gelatin silver print. 2001.058.002 Panama Canal Museum Collection, George A. Smathers Libraries. Gift of Dona Helmerichs. 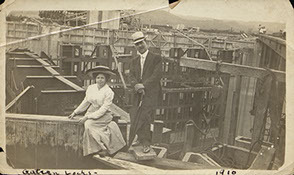 Arthur Luchesi and wife at Gatun Lock Construction. 1910. Gelatin silver print. 2008.024.003.001 Panama Canal Museum Collection, George A. Smathers Libraries. Gift of Joan Speiser. 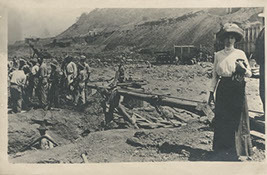 Florence Neville Miller at an active construction site. Gelatin silver print. 3.5 in. x 5.25 in. 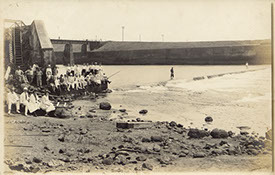 2014.49.1b Panama Canal Museum Collection, George A. Smathers Libraries. Gift of Malcolm Stone. Bowling Alleys, Y.M.C.A. Culebra, C.Z. Gelatin silver print. 5 in. x 7 in. 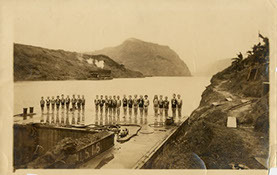 2001.95.002.001 Panama Canal Museum Collection, George A. Smathers Libraries. Gift of Sam Beckley.